Forests are a vital resource that provide people with jobs, food, and clean water, while they absorb harmful emissions to protect the climate. More than 1 billion people worldwide depend on forests. More than half of terrestrial species of plants and animals are found in forests. As much as 45 percent of terrestrial carbon is stored in forests. But, forests are under increasing pressure due to growing demand for food, land, and timber. The world loses 50 soccer fields of forests every minute of every day. Until now, much information about forests has been out-of-date, confusing, and inaccurate, as well as inconsistent across regions. Poor quality, out-of-date information contributes to bad forest management decisions, further imperiling the world’s forests. 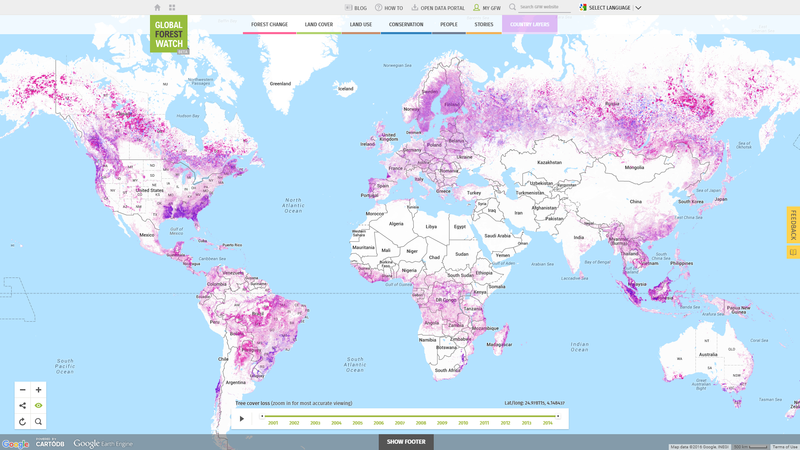 Technological revolutions—with falling costs and greater interactivity— are enabling the creation of forest monitoring and information systems that can be used by people around the world. Cloud computing allows the analysis of huge datasets. —The global high resolution data in GFW draw on analysis of over half a million Landsat satellite images. New satellite systems and better use of existing ones like Landsat and MODIS gives us global, high resolution data. —160 new earth observation satellite systems are currently in development. High-speed internet connectivity and associated human networking enable information to be shared at light speed. The costs of all these technologies continue to plummet. A growing number of governments and businesses are making major new commitments to stop deforestation and improve forest management, but they need better information to know where to act.